First I want to wish everyone a Happy Labor Day Holiday. Roof certifications is a very important document for your insurance company. First, the insurance company wants to know the condition of the roof, the age of the roof, and if there were any permits provided for the roof. A roof certification is very important also when it comes to buying or selling a home. If you are the seller and have a roof certification, then this is telling any potential buyer that the roof is good for so many additional years on the home. Being a buyer, this can be a great negotiating tool on any real-estate transaction. For example, if the roof life expectancy is only 5 years then you may want to use this as a bargaining product for the transaction. Lastly, a roof certification, maybe used for third parties. 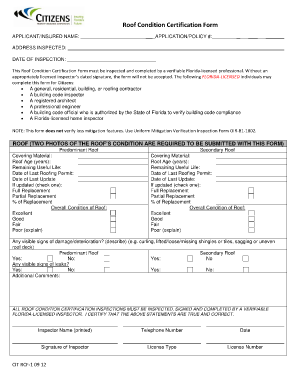 The third party certification can be used for roofers to certify their own work. Possibility, of Home Owner Associations to inspect the roofs for informational purposes to monitor the roofs near the end of its life span. And also, for expert testimonials when needed for lawyers and arbitration issues. So with this blog of #Roof Certification, I hope this will help you in your needs for the next roof certification as you need. Most certification write-ups will be on the Citizens Roof Certification form and is excepted by the majority of insurance companies and Realtor. For more information, about this or any other services we offer, please visit our web-site at www.emeraldinspectionservice.com or call our office anytime at; 352-322-2700 or toll free at 844-RADON-40.